The University of Alberta enlisted me to create a visual system for the 2015/16 artshows season. Aimed at students and young professionals, the system aims to bring together drama, art & design, and music under one What's On at UAlberta? campaign. I created these series of minimalist illustrations that work well as a system but still reflect the unique content and tone of each individual show. The system needed to utilize the colours of the Curious Arts Blog and be instantly recognizable. 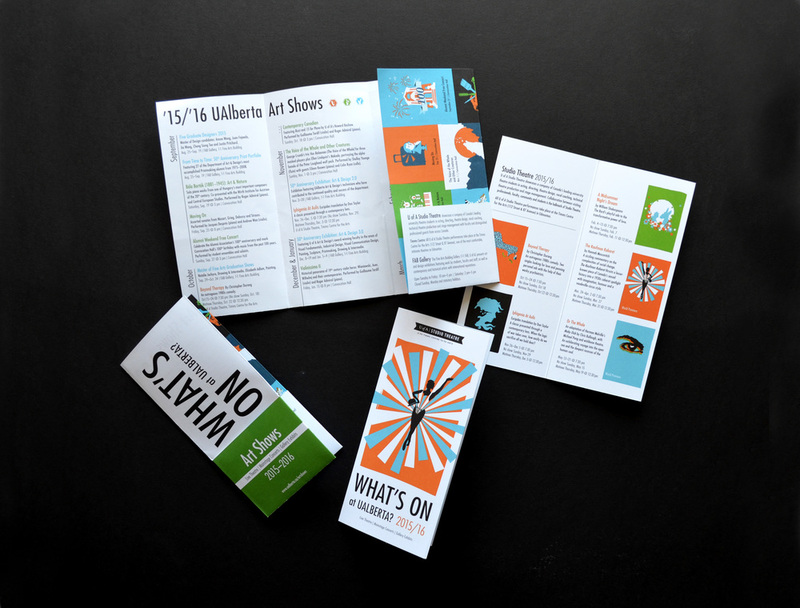 The second phase of the project took the illustrations and applied them to different collateral, including a full Art Shows calendar listing brochure and some smaller card brochures for music and drama. Check them out below! What's better than a calendar of events? How about a calendar that has a pocket for your tickets AND unfolds to make a poster? Yes, that would do it.